We commend your decision to invest in quality kayak instruction and invite you to discover why Potomac Paddlesports has had such a positive impact on the DC paddling community over the past two decades: we offer the most comprehensive, flexible, and friendly whitewater kayaking program—and one that's specifically tailored to the needs of beginning students. 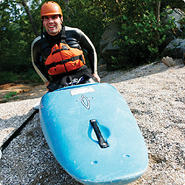 Our exclusive focus on paddling in our beginner program makes us unique in the region. Our instructors are among the best in the industry: all are certified by the American Canoe Association (ACA) and have been chosen by us for their patience, encouraging nature, and professionalism. Potomac Paddlesports also provides free use of high-quality equipment, learn-at-your-own-pace scheduling, free weeknight practice sessions, great deals on gear at our Potomac, MD retail store--located close to the river, and access to a unique social network. We look forward to paddling with you soon! Our Whitewater Membership Package gives you up to two years to master whitewater kayaking at your own pace, and we provide all the gear! Take the four courses at your leisure over a two-year period, during which time you can hone your skills and make friends in the paddling community at the coached weeknight practice sessions. All equipment is provided (and it's all brand new each season). Our friendly, non-intimidating approach has helped make this a top whitewater program in the region, if not the entire country. Bonus! Sign up for the Whitewater Membership Package and come out weekly to practice with our instructors, absolutely free. Simply show up at the parking lot and we head out together--kayak, paddle, skirt, helmet and PFD are provided. Be sure to leave time for the after practice social hour--and be ready to make new friends! Our four-hour WW 101 lesson is offered individually. This fun-filled, professionally coached kayaking lesson on flat water. We've eliminated much of the technical jargon so we can focus on comfort in the boat, comfort underwater, and rolling the kayak. By learning these skills in flatwater, you'll gain confidence and learn faster. At the conclusion of your class, if you find yourself wishing you'd signed up for the entire package, you can upgrade. This option is for students who signed up for the WW 101 class and want to upgrade to Whitewater Membership. You'll get WW 102-104 lessons plus free coached weeknight practice, post-practice social events, and special deals at our retail store. DC paddles and drinks the Potomac. Support the Potomac Riverkeeper! 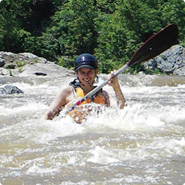 Potomac Paddlesports offers beginner whitewater kayak kayaking lessons near Washington DC where you will learn how to roll a kayak and have fun playing in the whitewater near Great Falls National Park and the Old Angler's Inn area. Over the past ten years we have created a large community of local Potomac paddlers by offering kayak lessons that you take at your own pace. Whether you are a slow or fast learner, you will appreciate our methodology. You'll also appreciate the fact that we let you practice with us every week between classes as often as you like. 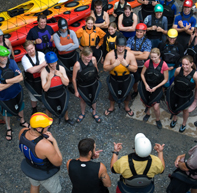 We provide all equipment and lessons are only 10 miles from the US Capital!So before you book a whitewater rafting trip in Harper's Ferry, consider the fact that you have some of the world's best whitewater just outside the DC beltway. 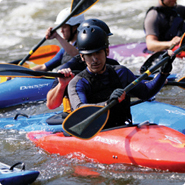 Start kayaking and learn on the Potomac River in Potomac Maryland, near Washington DC!